This week at Stampotique is Anything goes. My project was started with looking through my stamps and stirring at me on one of my shelves was my floor polish! 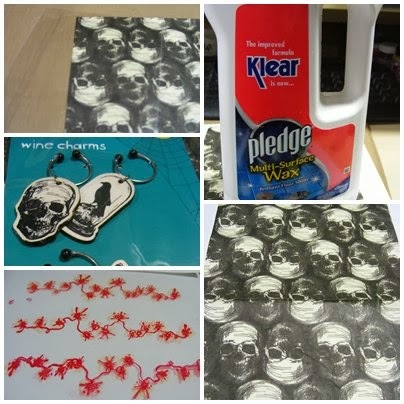 I started by getting my Halloween napkins and wine charms I purchased from Wilkinsons in the Halloween sale both cost me 50 pence. I sprayed a piece of napkin with cosmic shimmer sprays in red and green, then added diamond sparkle to the eye sockets on the skulls on the napkin. 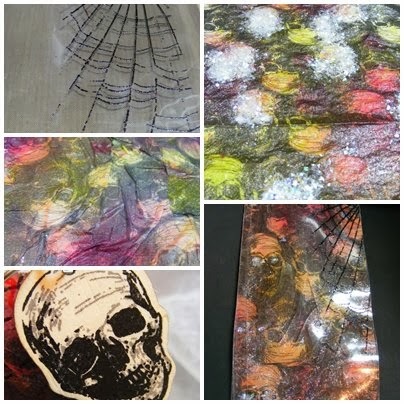 I then used a piece of acetate and stamped the Web onto it in versamark and used WOW ebony embossing powder and heat set. I then stamped the stringed lights on acetate 3 times with versamark and heat set with WOW apple embossing powder and coloured the lights with a yellow Promarker. I cut some of the lights and placed them over the web and also dotted them onto Moth Fab after she had been coloured in with Promarkers. The acetate web piece I turned over and put the dry inked napkin face down onto it then poured some of the floor polish onto the back of the napkin. I then scrunched the napkin into the liquid making a further effect on the back of the acetate. I then left this to dry. 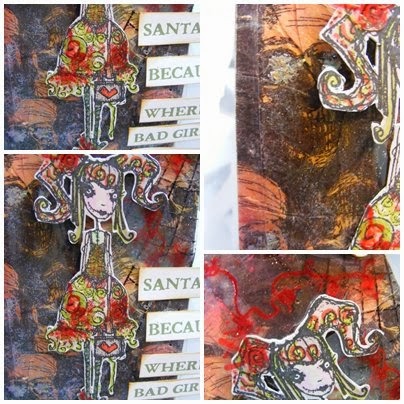 Once dry I attached the acetate to a tag with brads.This technique you can adapt for tissue paper and stamp your own background and add different mediums, glitters etc. The floor polish acts as a clear glue. Get some more inspiration from Sheena Douglas (she started it all off). The only place I have been able to purchase this polish is ASDA. It lasts for ages and was £3.99 for a 750ml bottle. I then put a wine charm through the tag hole. where all the bad girls live::. Dennis MillerHope this inspires you (a little) to be creative over the festive season.Sue…. That background has come out so well, it looks great! Well done, I must try it! Fab choice of stampotique stamp! This is by far one of the coolest techniques out there! Love the result, Sue. Great background, adorable image and perfect quote! Well choreographed! This is fabulous Sue! I love how you created it and the quote!! Thanks for joining us again at Stampotique this week.